It started when a group of Nuns from Rome began a school for the hearing impaired in Sri Lanka. They saw the need for an income for the mothers of these children and began a working group with them in the kindergarten of the school. From these small beginning the Araliya Community Company began. The women are employed in part time permanent positions, working five half days per week at award wages, with a pension provided at retirement age. Working in eight small groups, close to their homes, each member owns a share of the company and each group elects their own board member, contributing in all the company’s decisions. Originally the women worked from a group leader’s home but as they have grown some of them now work from the warehouse and office in Kochchikade which was built in 2008 with a grant from Etimos, an international financial consortium that invests in developing countries through financing producers cooperatives linked to Fair trade markets and social enterprises. In 2015 they completed the building of a factory allowing the women from Katana a permanent place to work from. With the growing demand for their products in Australia, the Netherlands and now also America the community has expanded to employ more women from the local villages. The products sold by this wonderful company not only allow these women to earn an income but provide a network for social change and group discussion and also contributes to the Don Severino Fabriani Institute for hearing impaired. The Araliya Community Company make all our coconut fibre strings products, Hanging Planters, Trivets, Placemats and decorative doormats, as well as our recycled paper products. 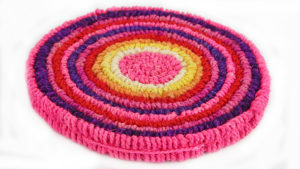 Araliya Company handmade pink & coloured coconut fibre trivet to protect your kitchen benches or dining table from hot pots, approx 20cm diameter. Fair Trade & sustainable. Handmade from magenta and rose coconut fibre with a polished coconut. 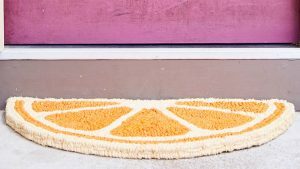 Fruity Door Mat Tangerine - SOLD OUT!